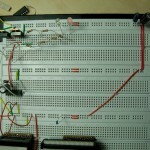 I started to build up the Open-BLDC circuit on a breadboard. Then a problem occurred. The low side works as it should but the high side just did not. After several hours of trying and reading the data sheet of IR2110 I gave up and asked Federico again for help. After some time we found an application note AN-978 from International Rectifier. This explained everything. You need to select very carefully the Boot capacitor. This is the one between VB and VS pins of IR2110. 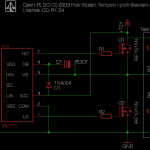 It is providing the charge for the gate of the high side MOSFET when you turn it on. For testing you can take a big capacitor, so that when you manually switch on the high side you see something happen. I took a 330uF capacitor and it is enough to turn the high side MOSFET on for about 30 seconds. Still you have to be careful because the capacitor only gets charged when the low side MOSFET is turned on. So after turning on the power the capacitor is not charged and you have to turn the low side MOSFET on first, then turn it off again and finally switch the high side on. In the final design one should probably select the right bootstrap capacitor. The equation for calculating that value is described on page 6 of the International Rectifier application note AN-978. You can probably get rid of the capacitor and the diode if you connect VCC directly to VB. The problem you get then is that when the current on VS gets higher then 12V you get a problem. But I may be mistaken. Correct me if I am wrong. I hope this helps someone. You can see my circuit for one half bridge attached to this post. 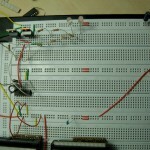 And a picture of my breadboard. 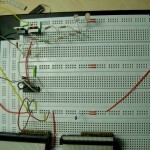 This entry was posted in Open-BLDC and tagged breadboard, electronics, Open-BLDC, powerstage, prototype on March 24, 2009 by esden. I am doing my project in sensorless control of BLDC. Right now I am implementing a 3-phase inverter for driving the motor. I am using 3, IR2110 for that. But the circuit is not giving proper output. I am getting both low side and high side pulses from the Ic, but when connected to the Mosfet bridge I am not getting any output. 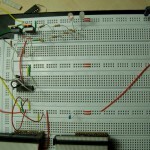 I am using 0.47microFared capacitor for Bootstrap operation. Please do give me a helping hand, so that i can fix the problem. I am not sure what your problem is. But you have to remember that the bootstrap capacitor only gets charged when you open the low side of the half bridge. 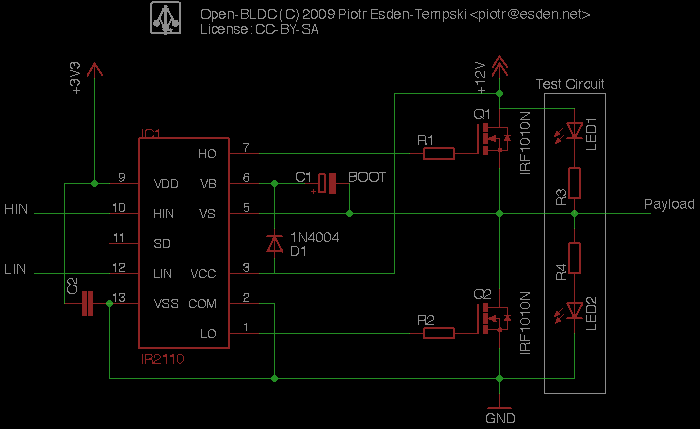 The low side should always work independent from the charge of the bootstrap capacitor. How about a progress update, its been about a month since this post. I’m very interested in this project as I’m working on a personal project w/ STM32, CAN, and looking into my own BLDC controller for RC motors. (Tri-Rotor instead of Quad-Rotor). Anyways, I’d like to see if I could contribute in some capacity to this project, i’m experienced w/ embedded systems, mechatronics, and RTOS. Have you gotten a prop spinning yet? hi, utsav here.can ne 1 tell me what capacitors n diodes i should use. You can find the pointer to that information in the datasheet. You can find the formula for calculating the bootstrap capacitor value in design tip DT98-2 section 3. It depends on the “Gate charge of high side FET”, “frequency of operation”, “Bootstrap capacitor leakage current” and “level shift charge required per cycle” (the last value is in your case 20nC for 1200V). So I can not provide the exact capacitor value for you, you have to calculate it yourself. the i/p capacitance of ur mosfet is too high. ir2110 may noty be able to drive such a high capacitance.. try ur luck with 3120 chip.. its better than ir2110 for driving mosfets.